OmniZero 2, A Fighting Robot | OhGizmo! While I enjoy your usual run-of-the-mill robot war TV show, I find the use of the word “robot” somewhat amusing. I mean, hey, yeah, those things are RC cars outfitted with armour, chainsaws and enough arsenal to maim an angry Tazmanian Devil… but, they’re hardly robots. At least, not in my interpretation of that word. These guys, on the other hand, are just too cool for words. 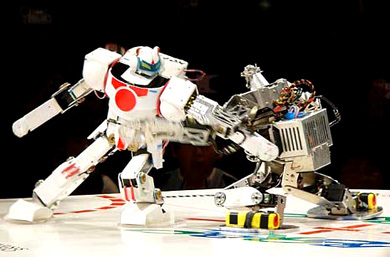 As part of the Robo-One 9 event held in Tokyo on March 18 and 19, a bunch of fully articulated mecha-ninjas got on the rink and beat the crap out of each other… in style. You have to see the winner, OmniZero 2, body slam, reverse body slam and pull crouching jabs at his opponents. Or even, well, do some fancy footwork that would make Muhammed Ali jealous. Hell, why don’t you see for yourselves, and come inside for some jaw-dropping video action?